With heavily-fancied duo Mark Selby and Ronnie O’Sullivan both suffering early exits, Ding was the new bookies’ favourite to lift a first world title ahead of the quarter-finals but it will take the most remarkable of comebacks for him to avoid crashing out on Wednesday morning. That’s because the Sheffield-based Chinese superstar trails Hawkins 11-5 with just two more frames required for the Kent potter to move into the semi-finals. Hawkins established a narrow 5-3 lead during the morning session but it was on Tuesday evening that he really shone to claim six of the eight frames on offer and edge to the brink of the last-four. Breaks of 60, 73 and 76 saw the Englishman extend his advantage to 8-3, although world No.3 Ding compiled runs of 102 and 52 to bring him back within three frames. That was ultimately nothing more than a false dawn however as Hawkins really put his foot on the 31-year-old’s throat to clinch the final three frames of the day, rounding things off with his first century of the match – a classy 113. 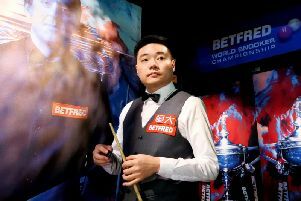 Having reached the semi-final and final at the Crucible in each of the last two years, Ding appeared ready to finally become the first-ever Chinese world champion – as he has been tipped to do for the past decade. 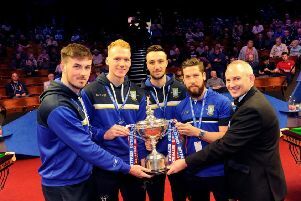 However, to keep that dream alive he will need an all-time great turnaround when the duo return to the baize at 10am today. *Watch the snooker World Championship LIVE on Eurosport and Eurosport Player with Colin Murray and analysis from Ronnie O’Sullivan, Jimmy White and Neal Foulds.